True story: in 1974 I took my grandmother on a trip to England. She'd been ill and recovered but my parents, fearing she might not be able to travel again in the near future, appointed me her willing chaperon and footed the bill for a two-week trip. I had just become interested in quilting and thought, "Aha! I'm visiting the mother country-there must be magnificent quilts in England!" But the problem, you understand, was getting to see English quilts. I took the "hunt 'em down" approach that I did back home and went to flea markets and antique stores and turned over everything. The few quilts I saw for sale were usually solid red and white and (now I know) of the strippy variety, c.1900. Not scrappy or colorful but tasteful and rather homogeneous in style. In one King's Road antiques store, I got my comeuppance. When I asked about patchwork quilts, the round-as-a-pear proprietor came up to me and steered me by the elbow back to the door of his shop, opened the door, and not-very-gently pushed me out onto the sidewalk with this pronouncement: "We're not in the rag trade here!" Slam! Perhaps this gentleman's view of patchwork quilts might have been influenced by images like this 1817 engraving of a woman named Priscilla, a London beggar, who made patchwork quilts to sell. I had no idea that in England during the early 1970's, at least in sophisticated London circles, patchwork quilts were considered the work of old ladies, somewhat tatty, and generally in bad taste. Since then I've been back to England several times and lo and behold, they have re-discovered their quilting heritage. Now English quilts are contemporary, very exciting, and when traditional, absolutely stunning. If I had an extra six weeks and God said, "Go, become a better quilter-" I'd hie myself to New Castle, England and apprentice myself to North Country quilter Lilian Hedley. Recently I saw an advert on the Web for some classes with Ms. Hedley and had an acute pang of envy. 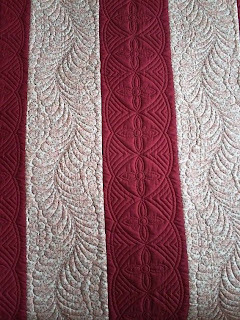 See Lilian's beautiful red and white strippy quilt, made in 1988, to the left.